Perhaps you’ve read our article on the 34th Presidents and want to find out more about the new Presidents and Secretaries, in which case you would have come to the right place. Or perhaps you’re curious as to what’s in store for the year ahead, in which case you would have come to the right place too. Or, if you just want a light-hearted read about the 35th Students’ Council, then this place still works! Through yet another interview with the Presidents (check out our previous one here) and Secretaries (collectively, the PresSecs) of the 35th Students’ Council, we give you the lowdown on their plans and dreams for Raffles. For the full interview’s transcript, click here! What does Council do exactly? When asked what she saw as Council’s main role in the school, Freda identifies it as “[uniting] the school population and [allowing] students to see beyond themselves”. In addition to this aim of getting Rafflesians to see themselves as part of a larger Rafflesian community, she explains, Council is also focused on rallying behind individual students with a support system that aids them in their endeavours. More than this, however, Council is also about the collective – not just the individual. And to this end, it aims to foster a sense of inclusivity and ownership of the school, such that Rafflesians can achieve a collective aim greater than the sum of their individual aspirations. Amidst all the various aims that Council has, the PresSecs branch of Council plays a role largely central to the fulfilment of these aims. The Secretaries, Ryan and Agatha, are in charge of managing the resources and finances of the Students’ Council, respectively. This ensures that efficient and prudent allocation of resources to exactly where they are needed (allocative efficiency, as we Economics students know it). The 2 Vice-Presidents, Minghui and Edward directly oversee the smooth running of the Houses and Departments, respectively. Right at the top, Freda the President is in charge of the bigger picture of Council, ensuring that everything fits into place, and acting if they do not. Freda also represents the Students’ Council in its correspondence with the school management and other Students’ Councils. Collectively, this group of 5 individuals are known as the PresSecs, and carry the heavy responsibility of uniting the Rafflesian community. VMGs – what? and how? 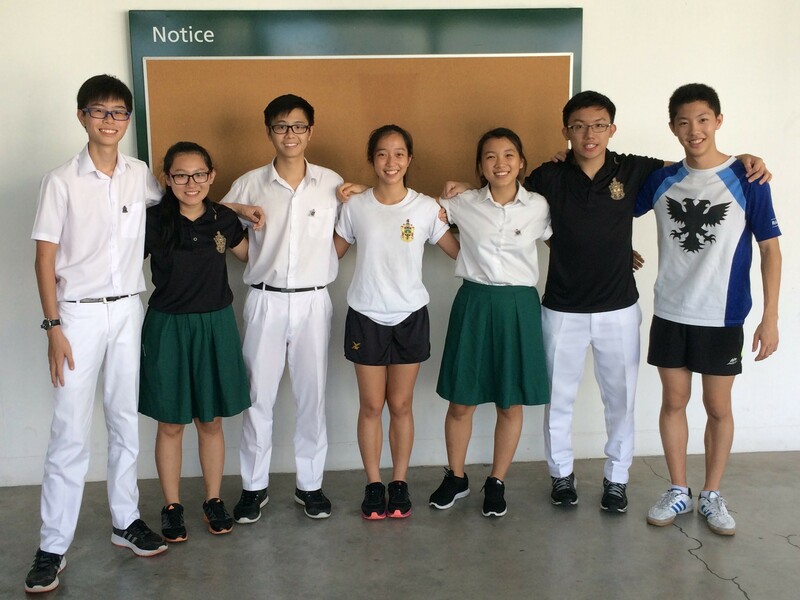 The Vision, Mission and Goals of the 35th Students’ Council – or the VMGs, as they term what determines the direction, and vectors the Councillors towards a common aim throughout their term. As mentioned above, the VMGs of the 35ths are targeted at creating an inclusive Rafflesian community. While its vision of ‘leading in serving and serving by leading’ remains the same each year, its missions and goals can vary across batches of Councillors. What we were interested in however, was what exactly went into the carving of the VMGs. And also, perhaps more interestingly, what was left out in the process. The whole process, Freda recounted, started from the departments. There, ideas were thrown around and common ideals and values they wanted to Council to model around were suggested. From the inputs given by all the departments, 3 clauses under the last 2 segments of the VMGs (Mission and Goals, respectively) were crafted. These then went through another round of discussion and voting – where a 2/3 majority was ensured before any one clause was accepted as the guiding light for the 35th Students’ Council. Inevitably, as with any mission-crafting process, compromises had to be made. In the case of the VMGs, some clauses fell short, while others did not manage to make the final cut. While these could be indicators of the 35ths’ priorities, they are no indicator of their importance. The PresSecs admitted that certain clauses were not as high up the agenda as the others. In particular, 6 clauses were omitted from the final VMG. In no order, these were: humility, being more personal, engaging the school population, empowering the students, synergising the strengths of students and uniting the school. That said, the fact that certain clauses were prioritized over the others does not indicate that the rest were any less essential or absent. As a matter of fact, even though sincerity was a clause chosen for the values segment, you can well expect that a Student Councillor can be sincere, yet humble and personable at the same time as all 3 are not necessarily mutually exclusive. That certain clauses were omitted does not mean we can expect any less of Student Councillors nor they of themselves. In crafting the VMGs, or the agenda, of the 35ths, the views of each Councillor were taken into account. In turn, these were based off certain observations of the school that they made. Some of these concerns were areas of strengths that could be capitalized on, while some focused on weaknesses or areas which were lacking in the school. In this section, we explore some of the initial assessments of Raffles that the Councillors had – in particular, the good and the bad. There had been a “very consistent effort [from] the 34ths, in a way that they are actively trying to gather feedback from the school population”, Edward pointed out to us. In addition, the 34ths were able to create sustainable initiatives that were kept alive long into its launch. For instance, the Humble Basket initiative that has been sustaining itself for many months now. The 34ths also put in place systems that set the foundation for the 35ths work. For instance, the match support system that involved all students by classes was set into motion by the 34ths – likewise, a system of announcements on Twitter was initiated by the 34ths too. All these systems made matters more efficient and simple for the batches to follow. Moving on to the batch of 2016, the PresSecs offered us comments on some of their strengths. Freda noted that the current Year 5s had a “sense of affability, being friendly, having the desire to support [their] friends and being willing to support them in the things that they’re passionate about.” In general, their batch seemed to them to be one more supportive of Councillors and valued the work done by them – which was something that “[they could] tap on.” Yet, while these statement are of course premature and casual, there exists in them a kernel of truth which the Councillors can tap on. Another area to capitalize on would be the internal structure of Council. Ryan Sam pointed out that while templates and systems might traditionally be seen as more bureaucracy and red tape, this is not always the case. Rather, systems are put in place to ensure the smooth running of an organization – Council, in this case. In this aspect, it would seem that processes implemented by the batch above would serve them well as they move on to their more complex functions. In general, the 35th PresSecs were unable to provide us much material on areas of concern in the school or weaknesses they could patch up. This may seem alarming at first – after all, how would they have crafted their VMGs without identifying areas of concern in the school? But upon closer inspection, you will find that they had reasons for being unable to do so at the time of the interview. For being unable to identify gaps in the school, they offered us 3 reasons that could qualify why. Chief among these was the fact that at the time of the interview, the PresSecs and their batch of Councillors had only started work formally for about a month, and it was therefore “too early in [their] term”. This amount of time would have been just enough for the 35th Councillors to get a feel of the school, the inner workings of Council, and all while learning the ropes from their seniors. The 35ths would hence still be in the middle of gathering feedback to assess the ground situation and structuring their plans around that. Therefore, it is understandable that they were unable to identify areas of concern within such a small time frame. Secondly, the PresSecs were cautious that any hasty generalizations they could make would remain only as that – generalizations. After all, we are but a batch of 1200 students, how can we possibly hope to describe all 1200 unique personalities and personality flaws with just one all-encompassing character trait? The simple response is that we can’t, and as Minghui put it “it may not be representative of the batch” and “[needs] to be substantiated”. Finally, and perhaps the reason that resonates most with them – they “[chose] to see it more positively”. In doing so, the 35th Councillors wanted to focus more on the strengths of our Lumiere batch that could be tapped on as a source of energy, rather than to look closely at our weaknesses. This optimism is highly admirable – after all, what’s a pessimistic outlook worth? As it stands, few areas of concern regarding the school were raised during the interview, if at all. While it may seem on the surface that nothing’s wrong, the 35th Councillors must constantly keep 2 fingers on the pulse of the school, monitoring, waiting, and keeping an eye out for any irregularities in the school. At the first sign of these, they must be ready to tackle the problems head-on. Moving forward, the 35th Students’ Council shared with us their short-term and long-term goals. In the short run, the 35ths are working on their action plan for their term. At press time, the PresSecs and other departments were unable to offer us any concrete plans or guarantees as approvals were still being seeked for their proposals. However, do stay tuned because they seem to have some exciting plans in store for us! A possible challenge that Council might face internally would be Councillors losing a sense of purpose, or as Minghui put it, “it may be quite dangerous if councillors only focus on the hows and not the whys.” In essence, if Councillors lost track of the real purpose of Council and focused too much on the fine details of events, then they risk missing out on the rationale of organizing such events in the first place, and in turn – their motivation. Finally, in the long run, Council must consider other avenues for service as well. In the interview, we raised the possibility of Council taking on a larger role in school discipline. To this, the PresSecs told us that at current, their Councillors play the indirect role of role models of character, and not enforcing any rules through a booking system. At the 34th Presidents interview, a possible dialogue hosted by Commz’D about school discipline was hinted at. While this could be a good opportunity for students and Councillors alike to share their views on school discipline and the part they play, it is no indicator of Council taking on a more disciplinarian role. For all that has been said about what went right and what went wrong, the 35th Students’ Council, like their predecessors, have a heavy responsibility resting upon their shoulders. Perhaps as they have said, it may be too early to make any assessments of the situation in school, but what we can be certainly sure of judging from the energy and enthusiasm displayed at the interview, is that they will give their best shot! And to this end, we wish them the best of luck in the term ahead.